Received: September 5, 2016; Revised: October 23, 2016; Accepted: October 24, 2016; Published online: December 1, 2016. There is a greater incidence of discoid meniscus in Asian countries than in Western countries, and bilateral discoid menisci are also common. The discoid meniscus may be a congenital anomaly, and genetics or family history may play a role in the development of discoid menisci. Because the histology of discoid meniscus is different from that of normal meniscus, it is prone to tearing. Individuals with a discoid meniscus can be asymptomatic or symptomatic. Asymptomatic discoid menisci do not require treatment. However, operative treatment is necessary if there are symptoms. Total meniscectomy leads to an increased risk of osteoarthritis. Therefore, total meniscectomy is generally reserved for rare unsalvageable cases. Partial meniscectomy (saucerization) with preservation of a stable peripheral rim combined with or without peripheral repair is effective, and good short-, mid-, and long-term clinical results have been reported. The discoid meniscus was first observed in a cadaver specimen by Young1) in 1889. For many years, the discoid meniscus was considered to be synonymous with snapping knee syndrome, which was first described by in 19362). The incidence of discoid lateral meniscus is estimated to be 0.4% to 17%, whereas the discoid medial meniscus is extremely rare (0.1% to 0.3%)3–6). It has been reported that about 20% of cases are bilateral5,7,8). However, the true incidence and prevalence are unknown, given that many asymptomatic discoid menisci are incidentally discovered during surgery9). Some authors have reported that magnetic resonance imaging (MRI) or arthroscopic evaluation reveals higher rates (79% to 97%) of bilateral discoid lateral meniscus in patients presenting with symptomatic unilateral discoid lateral meniscus10,11). There is a greater incidence of discoid meniscus in Asian countries than in Western countries12–14). Fukuta et al.12) reported an incidence of 13% in Japan, Kim et al.13) observed an incidence of 10.6% in Korea, and Rao et al.14) noted an incidence of 5.8% in India. In contrast, Jordan15) described an incidence of 3% to 5% in the United States. This review summarizes the current knowledge on the diagnosis and treatment of discoid meniscus. Smillie16) suggested that the discoid meniscus is congenital. The discoid shape is an intermediate stage during fetal development, and final discoid morphology results from absorption failure of the central part of the menisci. However, the discoid shape has not yet been identified in anatomical studies on either human or animal embryos17,18). The discoid meniscus may indeed be a congenital anomaly9,17), and genetic or familial factors may play a role in the development of discoid menisci8,19). Some authors have reported bilateral discoid menisci in identical female twins20) or in a family of three brothers and sisters20,21). The histology and ultrastructure of discoid meniscus is different from that of normal meniscus. The discoid meniscus is characterized by decreased collagen fibers and loss of normal collagen orientation, and intrameniscal mucoid degeneration is also common9,22). Papadopoulos et al.23) documented significant disorganization of the circular collagen network and a heterogeneous course of the circumferentially arranged collagen fibers in discoid meniscus structure. They also proposed that the discoid lesion is a structural rather than a morphological variant. In addition to structural abnormality, the increased thickness and abnormal vascularity of the discoid meniscus makes it prone to tearing17). Morphological changes may also occur to compensate for an abnormally unstable meniscus during development18). Recently, some authors have reported regeneration after partial meniscectomy of the discoid meniscus24–26). This regeneration supports the possibility that the discoid meniscus arises through variant morphogenesis26). Watanabe et al.27) classified the discoid menisci as complete, incomplete, and Wrisberg types, depending on the presence or absence of a normal posterior attachment and the degree of tibial plateau coverage (Fig. 1). The complete type refers to the disc-shaped meniscus that completely covers the lateral tibial plateau and has a normal posterior attachment. The incomplete type has a semilunar shape and a normal posterior attachment, but it covers less than 80% of the lateral tibial plateau9,27). The Wrisberg type is more normally shaped than the complete and incomplete types, but it lacks the usual posterior meniscal attachments (coronary ligament), and only the Wrisberg ligament connects the posterior horn of the lateral meniscus. Due to the hypermobility of the lateral meniscus in this type, the meniscus is subject to displacement in knee flexion and extension, which is postulated to cause the classic snapping knee syndrome9). Although this classification is commonly used, its usefulness for surgical decision making is doubtful28). Klingele et al.29) described patterns of peripheral rim instability in discoid menisci. They defined instability as evidence of hypermobility and peripheral detachment of the remnant meniscus in arthroscopic assessment. They further differentiated the unstable menisci of both the complete and incomplete types according to the location of instability (anterior, middle, and posterior horn)30). Ahn et al.31) proposed an MRI classification based on the presence or direction of meniscal shift: no shift, anterocentral shift, posterocentral shift, and central shift. They reported that shift-type knees had more peripheral tears than no-shift knees. They also classified discoid lateral meniscus tears based on arthroscopic evaluation of both peripheral rim stability and tear site: 1) meniscocapsular junction, anterior horn type, 2) meniscocapsular junction, posterior horn type, and 3) posterolateral corner loss type (Fig. 2)32). These MRI and arthroscopic classifications provide more information to surgeons on appropriate treatment methods for discoid lateral menisci. Individuals with a discoid meniscus can be asymptomatic5). If there is a tear or instability, symptoms typically develop in discoid meniscus28). However, a click or pain can develop even in the absence of a tear or instability33). Symptoms of discoid meniscus include insidious popping or snapping without a traumatic origin, which is associated with pain, giving way, effusion, quadriceps atrophy, limited range of motion, and clicking or locking28,34). Snapping knee syndrome, in which a clunk is heard at the end of flexion, is usually related to an unstable meniscus variant, such as the Wrisberg type35,36). In very young children (range, 3 to 4 years), snapping is often asymptomatic, whereas older children (range, 8 to 10 years) more commonly experience pain with activity37). In addition, the older child may present with more acute symptoms than younger children28). The most common tear pattern of the discoid meniscus is a horizontal tear30,38–40). Repetitive microtrauma to the abnormal collagen arrangement is thought to cause horizontal tears after mucoid degeneration9,41). Radiographs are often normal in patients with a discoid meniscus; however, they may reveal some radiologic features of discoid meniscus, such as widening of the lateral joint space, a squared-off appearance of the lateral femoral condyle, cupping of the lateral tibial plateau, elevation of the fibular head, and tibial eminence flattening9,14,19). On MRI, a discoid meniscus can be diagnosed when the ratio of the minimal meniscal width to the maximal tibial width is more than 20% on the coronal image, and the ratio of sum of the width of both lateral horns to the maximal meniscal diameter on the sagittal image is more than 75%42). Araki et al.43) have proposed that the discoid meniscus is present when the meniscal width is over 15 mm on the coronal slice. Continuity of the meniscus between the anterior and posterior horns on three or more 5-mm thick consecutive sagittal slices demonstrates the presence of a discoid meniscus6). An abnormal, thickened, bow-tie appearance of the meniscus is suggestive of discoid meniscus28). In the Wrisberg variant, an MRI scan may show subtle anterior subluxation of the posterior horn of the lateral meniscus or high T2-weighted signal intensity, simulating a peripheral tear35). However, some authors have reported low sensitivity in detecting the lateral discoid meniscus in children and have suggested that MRI does not provide enhanced diagnostic utility over clinical examination44) because checking the stability of a discoid meniscus on an MRI scan is difficult, and some incomplete discoid menisci often look normal9,19). Nonetheless, MRI is useful in detecting the presence of meniscus tear and a shift of the meniscus. This information can aid the surgeon in determining the appropriate surgical technique, such as saucerization or repair31,45). Diagnostic arthroscopy may be needed to confirm the diagnosis of discoid meniscus in a symptomatic patient with instability or with the Wrisberg variant, showing a normal shape and MRI appearance5). On physical examination, patients show joint line tenderness, effusion, joint line bulging, and even a positive McMurray test7,15). The accuracy of physical examination ranges from 29% to 93% and varies according to the examiner’s experience and knowledge of this anomaly44,46). The factors determining treatment include the type of discoid meniscus, concomitant symptoms, duration of symptoms, and age47). Most cases of discoid meniscus remain asymptomatic and do not require treatment, even when snapping is present9,47–49) because the knee may have adapted to the discoid anatomy and continues to function well39). However, there is some debate about the need for treatment in cases of asymptomatic, stable discoid meniscus found incidentally during evaluation or treatment of some other knee conditions28). If there are symptoms such as pain, locking, swelling, giving way, or instability, it is necessary to operate28). In the case of a symptomatic but stable meniscus, some authors have suggested total meniscectomy due to the risk of intrinsic abnormalities in the remaining meniscal tissue50). However, many studies have suggested that total meniscectomy leads to a high risk of osteoarthritis9,51,52). Total meniscectomy is generally avoided in children, except in rare cases in which the entire meniscus is deemed to be unsalvageable9). Partial meniscectomy (saucerization) with preservation of a stable peripheral rim, with or without peripheral repair, is effective and has been recommended by many authors7,32,48). For the unstable type, repair of the posterior tibial detachment is important to eliminate the risk of osteoarthritis after total meniscectomy3,15). Arthroscopic partial meniscectomy (saucerization) is most commonly recommended. This treatment attempts to change the meniscus to a more normal shape and size3,9,19,30,32,38,40,48,49). In cases of peripheral tear in the vascular zone, arthroscopic meniscal repair can be done with saucerization according to advancement of the repair technique32,48). The goal of saucerization is to create a stable and functional meniscus that will provide adequate shock absorption without retearing9). Many authors have recommended that at least 6 mm to 8 mm from the periphery should remain8,48,49); however, larger meniscal remnants after saucerization have been associated with increased re-tear rates39). After partial meniscectomy (saucerization) and/or repair of a discoid meniscus, the remaining discoid meniscus is more vulnerable to tearing than the normal meniscus because the cartilage remains thickened due to the abnormal discoid meniscus19). A complication unique to discoid meniscus surgery is osteochondritis dissecans (OCD) of the lateral femoral condyle, which can occur after total or partial meniscetomy of the discoid lateral meniscus. Repeated impaction in the immature chondral structure after resection of the discoid meniscus might predispose to the development of OCD in the lateral femoral condyle53,54). In addition, the change of alignment to valgus after resection of a thick discoid meniscus can lead to concentrated stress on the lateral femoral condyle55). Many authors have reported good clinical results after partial meniscectomy with or without meniscus repair over short-, mid-, and long-term follow ups30,32,49,50,54,56–59) (Table 1). Ahn et al.32) reported in their study with a minimum 2-year follow-up (mean, 51 months) that arthroscopic partial meniscectomy with peripheral repair was effective for treating symptomatic discoid lateral menisci. In a short-term follow-up study (mean, 37.4 months), Good et al.30) also reported on the efficacy of arthroscopic saucerization with repair. Ogut et al.57) reported on 10 knees with complete discoid lateral menisci that underwent arthroscopic partial meniscectomy; after a mean follow-up of 4.5 years, 9 cases had excellent results, and there was no evidence of degenerative changes on radiographic examination. In a study with a 5-year follow-up, Atay et al.49) reported that 85% of cases showed good or excellent results after partial meniscectomy; however, femoral condyle flattening occurred in a significant percentage. In a study with a 5.5-year follow-up, Aichroth et al.50) reported that 84% of cases showed excellent or good results after total or partial meniscectomy. Recently, Yoo et al.54) found that Lysholm scores increased from a mean of 70.0 to a mean of 91.6 at the final follow-up irrespective of the meniscectomy method (partial or subtotal) after a mean of 4.7 years. Ahn et al.59) reported in their long-term follow-up study (mean, 10.1 years) that 94% of patients had excellent or good clinical results; however, progressive degenerative changes appeared in 40% of patients. Some authors have described good clinical results of meniscal allograft transplantation after total meniscectomy for a torn discoid lateral meniscus60). Some authors have suggested that younger patients are more likely to achieve better results after partial or total meniscectomy54,61). In addition, removing a greater amount of meniscus has been associated with increased contact pressure on the cartilage and thus an increased risk of cartilage degeneration58). Several studies have found that the results of partial meniscectomy are better than those of total meniscectomy both clinically and radiologically58,59,62). Kim et al.58) assessed the mid-term clinical and radiological outcomes of discoid lateral meniscus treated by partial or total meniscectomy and found that partial meniscectomy was associated with better radiographic results after a 5-year follow-up. In a long-term follow-up study (mean, 10.1 years), Ahn et al.59) also reported that subtotal meniscectomy was associated with increased degenerative changes compared with partial meniscectomy with or without repair. Lee et al.62) found better radiological results after partial meniscectomy than subtotal/total meniscectomy in a mid-term follow-up, but clinical results did not differ significantly between treatment types. The incidence of discoid meniscus is greater in Asian countries than in Western countries, and bilateral discoid menisci are common. The discoid meniscus may be a congenital anomaly, and the structure of discoid meniscus is different from that of normal meniscus. Therefore, it is more prone to tearing than a normal meniscus. Asymptomatic discoid menisci do not require treatment. However, if there are symptoms, operative treatment is necessary. Since total meniscectomy leads to a high risk of osteoarthritis, total meniscectomy should be avoided except for unsalvageable cases. Partial meniscectomy (saucerization) with preservation of a stable peripheral rim combined with or without peripheral repair is recommended, and good clinical results have been reported. Fig. 1. Watanabe classification. (A) The complete type is the disc-shaped meniscus that completely covers the lateral tibial plateau and has a normal posterior attachment. (B) The incomplete type has a semilunar shape and normal posterior attachment, but it covers less than 80% of the lateral tibial plateau. (C) The Wrisberg type is more normally shaped compared to the complete or incomplete type of discoid meniscus, but it lacks the usual posterior meniscal attachments (coronary ligament), and only the Wrisberg ligament connects the posterior horn of the lateral meniscus. Fig. 2. Magnetic resonance imaging findings and arthroscopic views of the discoid meniscus according to the corresponding tear pattern. A peripheral tear refers to a longitudinal tear in the meniscocapsular junction area, anterior horn (posterocentral shift, left column), and posterior horn (anterocentral shift, middle column). The white dotted arrow (bottom, left column) shows the wide gap between the anterolateral border of the meniscus and the joint capsule. Posterolateral corner loss refers to the absence of the posterolateral portion of the discoid meniscus due to degenerative tears around the popliteal hiatus (central shift). F/U: follow-up, HSS: Hospital for Special Surgery, MRI: magnetic resonance imaging. Middleton, DS (1936). Congenital disc-shaped lateral meniscus with snapping knee. Br J Surg. 24, 246-55. Ikeuchi, H (1982). Arthroscopic treatment of the discoid lateral meniscus. Technique and long-term results. Clin Orthop Relat Res, 19-28. Kini, SG, Walker, P, and Bruce, W (2015). Bilateral symptomatic discoid medial meniscus of the knee: a case report and review of literature. Arch Trauma Res. 4, e27115. Kelly, BT, and Green, DW (2002). Discoid lateral meniscus in children. Curr Opin Pediatr. 14, 54-61. Silverman, JM, Mink, JH, and Deutsch, AL (1989). Discoid menisci of the knee: MR imaging appearance. Radiology. 173, 351-4. Fleissner, PR, and Eilert, RE (1999). Discoid lateral meniscus. Am J Knee Surg. 12, 125-31. Yaniv, M, and Blumberg, N (2007). The discoid meniscus. J Child Orthop. 1, 89-96. Kramer, DE, and Micheli, LJ (2009). Meniscal tears and discoid meniscus in children: diagnosis and treatment. J Am Acad Orthop Surg. 17, 698-707. Ahn, JH, Lee, SH, Yoo, JC, Lee, HJ, and Lee, JS (2010). Bilateral discoid lateral meniscus in knees: evaluation of the contralateral knee in patients with symptomatic discoid lateral meniscus. Arthroscopy. 26, 1348-56. Bae, JH, Lim, HC, Hwang, DH, Song, JK, Byun, JS, and Nha, KW (2012). Incidence of bilateral discoid lateral meniscus in an Asian population: an arthroscopic assessment of contralateral knees. Arthroscopy. 28, 936-41. Fukuta, S, Masaki, K, and Korai, F (2002). Prevalence of abnormal findings in magnetic resonance images of asymptomatic knees. J Orthop Sci. 7, 287-91. Kim, SJ, Lee, YT, and Kim, DW (1998). Intraarticular anatomic variants associated with discoid meniscus in Koreans. Clin Orthop Relat Res, 202-7. Rao, PS, Rao, SK, and Paul, R (2001). Clinical, radiologic, and arthroscopic assessment of discoid lateral meniscus. Arthroscopy. 17, 275-7. Jordan, MR (1996). Lateral meniscal variants: evaluation and treatment. J Am Acad Orthop Surg. 4, 191-200. Smillie, IS (1948). The congenital discoid meniscus. J Bone Joint Surg Br. 30, 671-82. Clark, CR, and Ogden, JA (1983). Development of the menisci of the human knee joint. Morphological changes and their potential role in childhood meniscal injury. J Bone Joint Surg Am. 65, 538-47. Kaplan, EB (1957). Discoid lateral meniscus of the knee joint; nature, mechanism, and operative treatment. J Bone Joint Surg Am. 39, 77-87. Hart, ES, Kalra, KP, Grottkau, BE, Albright, M, and Shannon, EG (2008). Discoid lateral meniscus in children. Orthop Nurs. 27, 174-9. Gebhardt, MC, and Rosenthal, RK (1979). Bilateral lateral discoid meniscus in identical twins. J Bone Joint Surg Am. 61, 1110-1.
de Lambilly, C, Pascarel, X, Chauvet, JF, Marle, JL, and Honton, JL (1991). External discoid menisci: apropos of a familial series of 6 cases. Rev Chir Orthop Reparatrice Appar Mot. 77, 359-61. Atay, OA, Pekmezci, M, Doral, MN, Sargon, MF, Ayvaz, M, and Johnson, DL (2007). Discoid meniscus: an ultrastructural study with transmission electron microscopy. Am J Sports Med. 35, 475-8. Papadopoulos, A, Kirkos, JM, and Kapetanos, GA (2009). Histomorphologic study of discoid meniscus. Arthroscopy. 25, 262-8. Stein, MI, Gaskins, RB, Nalley, CC, and Nofsinger, C (2013). Regeneration of a discoid meniscus after arthroscopic saucerization. Am J Orthop (Belle Mead NJ). 42, E5-8. Soejima, T, Kanazawa, T, Tabuchi, K, Noguchi, K, Inoue, T, and Murakami, H (2013). Regeneration of ring-shaped lateral meniscus after partial resection of discoid meniscus with anterior cruciate ligament reconstruction. Int J Surg Case Rep. 4, 1093-6. Bisicchia, S, and Tudisco, C (2013). Re-growth of an incomplete discoid lateral meniscus after arthroscopic partial resection in an 11 year-old boy: a case report. BMC Musculoskelet Disord. 14, 285. Kushare, I, Klingele, K, and Samora, W (2015). Discoid meniscus: diagnosis and management. Orthop Clin North Am. 46, 533-40. Klingele, KE, Kocher, MS, Hresko, MT, Gerbino, P, and Micheli, LJ (2004). Discoid lateral meniscus: prevalence of peripheral rim instability. J Pediatr Orthop. 24, 79-82. Good, CR, Green, DW, Griffith, MH, Valen, AW, Widmann, RF, and Rodeo, SA (2007). Arthroscopic treatment of symptomatic discoid meniscus in children: classification, technique, and results. Arthroscopy. 23, 157-63. Ahn, JH, Lee, YS, Ha, HC, Shim, JS, and Lim, KS (2009). A novel magnetic resonance imaging classification of discoid lateral meniscus based on peripheral attachment. Am J Sports Med. 37, 1564-9. Ahn, JH, Lee, SH, Yoo, JC, Lee, YS, and Ha, HC (2008). Arthroscopic partial meniscectomy with repair of the peripheral tear for symptomatic discoid lateral meniscus in children: results of minimum 2 years of follow-up. Arthroscopy. 24, 888-98. Francavilla, ML, Restrepo, R, Zamora, KW, Sarode, V, Swirsky, SM, and Mintz, D (2014). Meniscal pathology in children: differences and similarities with the adult meniscus. Pediatr Radiol. 44, 910-25. Mutlu, S, Mutlu, H, Mutlu, B, Guler, O, and Duymus, TM (2014). Symptoms of discoid lateral menisci. J Orthop. 11, 180-2. Singh, K, Helms, CA, Jacobs, MT, and Higgins, LD (2006). MRI appearance of Wrisberg variant of discoid lateral meniscus. AJR Am J Roentgenol. 187, 384-7. Wong, T, and Wang, CJ (2011). Functional analysis on the treatment of torn discoid lateral meniscus. Knee. 18, 369-72. Dickhaut, SC, and DeLee, JC (1982). The discoid lateral-meniscus syndrome. J Bone Joint Surg Am. 64, 1068-73. Bellisari, G, Samora, W, and Klingele, K (2011). Meniscus tears in children. Sports Med Arthrosc. 19, 50-5. Hayashi, LK, Yamaga, H, Ida, K, and Miura, T (1988). Arthroscopic meniscectomy for discoid lateral meniscus in children. J Bone Joint Surg Am. 70, 1495-500. Kocher, MS, Klingele, K, and Rassman, SO (2003). Meniscal disorders: normal, discoid, and cysts. Orthop Clin North Am. 34, 329-40. Smith, CF, Van Dyk, GE, Jurgutis, J, and Vangsness, CT (1999). Cautious surgery for discoid menisci. Am J Knee Surg. 12, 25-8. Samoto, N, Kozuma, M, Tokuhisa, T, and Kobayashi, K (2002). Diagnosis of discoid lateral meniscus of the knee on MR imaging. Magn Reson Imaging. 20, 59-64. Araki, Y, Ashikaga, R, Fujii, K, Ishida, O, Hamada, M, Ueda, J, and Tsukaguchi, I (1998). MR imaging of meniscal tears with discoid lateral meniscus. Eur J Radiol. 27, 153-60. Kocher, MS, DiCanzio, J, Zurakowski, D, and Micheli, LJ (2001). Diagnostic performance of clinical examination and selective magnetic resonance imaging in the evaluation of intraarticular knee disorders in children and adolescents. Am J Sports Med. 29, 292-6. Yilgor, C, Atay, OA, Ergen, B, and Doral, MN (2014). 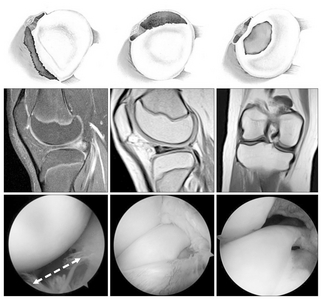 Comparison of magnetic resonance imaging findings with arthroscopic findings in discoid meniscus. Knee Surg Sports Traumatol Arthrosc. 22, 268-73. Stanitski, CL (1998). Correlation of arthroscopic and clinical examinations with magnetic resonance imaging findings of injured knees in children and adolescents. Am J Sports Med. 26, 2-6. Sun, Y, and Jiang, Q (2011). Review of discoid meniscus. Orthop Surg. 3, 219-23. Adachi, N, Ochi, M, Uchio, Y, Kuriwaka, M, and Shinomiya, R (2004). Torn discoid lateral meniscus treated using partial central meniscectomy and suture of the peripheral tear. Arthroscopy. 20, 536-42. Atay, OA, Doral, MN, Leblebicioglu, G, Tetik, O, and Aydingoz, U (2003). Management of discoid lateral meniscus tears: observations in 34 knees. Arthroscopy. 19, 346-52. Aichroth, PM, Patel, DV, and Marx, CL (1991). Congenital discoid lateral meniscus in children: a follow-up study and evolution of management. J Bone Joint Surg Br. 73, 932-6. Fairbank, TJ (1948). Knee joint changes after meniscectomy. J Bone Joint Surg Br. 30, 664-70. Raber, DA, Friederich, NF, and Hefti, F (1998). Discoid lateral meniscus in children. Long-term follow-up after total meniscectomy. J Bone Joint Surg Am. 80, 1579-86. Stanitski, CL, and Bee, J (2004). Juvenile osteochondritis dissecans of the lateral femoral condyle after lateral discoid meniscal surgery. Am J Sports Med. 32, 797-801. Yoo, WJ, Jang, WY, Park, MS, Chung, CY, Cheon, JE, Cho, TJ, and Choi, IH (2015). Arthroscopic treatment for symptomatic discoid meniscus in children: midterm outcomes and prognostic factors. Arthroscopy. 31, 2327-34. Hashimoto, Y, Yoshida, G, Tomihara, T, Matsuura, T, Satake, S, Kaneda, K, and Shimada, N (2008). Bilateral osteochondritis dissecans of the lateral femoral condyle following bilateral total removal of lateral discoid meniscus: a case report. Arch Orthop Trauma Surg. 128, 1265-8. Lee, CH, Song, IS, Jang, SW, and Cha, HE (2013). Results of arthroscopic partial meniscectomy for lateral discoid meniscus tears associated with new technique. Knee Surg Relat Res. 25, 30-5. Ogut, T, Kesmezacar, H, Akgun, I, and Cansu, E (2003). Arthroscopic meniscectomy for discoid lateral meniscus in children and adolescents: 4.5 year follow-up. J Pediatr Orthop B. 12, 390-7. Kim, SJ, Chun, YM, Jeong, JH, Ryu, SW, Oh, KS, and Lubis, AM (2007). Effects of arthroscopic meniscectomy on the long-term prognosis for the discoid lateral meniscus. Knee Surg Sports Traumatol Arthrosc. 15, 1315-20. Ahn, JH, Kim, KI, Wang, JH, Jeon, JW, Cho, YC, and Lee, SH (2015). Long-term results of arthroscopic reshaping for symptomatic discoid lateral meniscus in children. Arthroscopy. 31, 867-73. Kim, JM, and Bin, SI (2006). Meniscal allograft transplantation after total meniscectomy of torn discoid lateral meniscus. Arthroscopy. 22, 1344-50. Okazaki, K, Miura, H, Matsuda, S, Hashizume, M, and Iwamoto, Y (2006). Arthroscopic resection of the discoid lateral meniscus: long-term follow-up for 16 years. Arthroscopy. 22, 967-71. Lee, DH, Kim, TH, Kim, JM, and Bin, SI (2009). Results of subtotal/total or partial meniscectomy for discoid lateral meniscus in children. Arthroscopy. 25, 496-503.